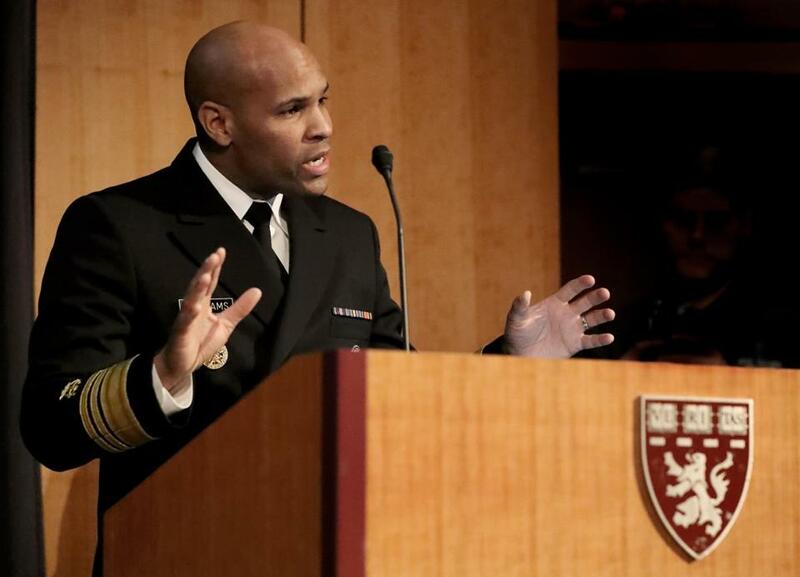 The surgeon general, Vice Admiral Jerome Adams, spoke at Harvard for a two-day summit on opioids. US Surgeon General Jerome Adams told a gathering of police leaders Thursday that law enforcement, health care groups, and community organizations must collaborate if the country is to contain the deadly opioid crisis. “We cannot create behavioral and cultural change and we will not achieve our individual and mutual goals unless we sit at each other’s tables, share lessons learned, and challenge each other to do better, and to do it together,” Adams said at the start of the two-day summit sponsored by the Police Assisted Addiction & Recovery Initiative. About 400 law enforcement and public officials from around the state and the country gathered at Harvard Medical School to highlight the role police are playing to help quell the epidemic. The recovery initiative, or PAARI, has placed thousands of people with opioid addiction into treatment programs rather than arresting them for drug abuse. More than 30 states participate in the initiative, which includes more than 450 police departments. The summit took place as the opioid crisis continues across the United States. Recent figures from the Centers for Disease Control and Prevention show that drug overdoses killed more than 70,000 Americans in 2017, a record, driven in large part by the increased use of synthetic opioids such as fentanyl. Massachusetts was one of only eight states where overdose deaths declined in 2017. The number of deaths fell 8.3 percent, to 1,977. The state’s efforts to widely distribute the overdose-reversing drug naloxone (commonly known by the brand name Narcan) has likely played a role in shrinking the death rate. Police and firefighters throughout the state now carry the drug, and anyone can buy it at a pharmacy. Governor Charlie Baker credited the Gloucester Police Department’s Angel Program with “changing the tenor and the mood” of conversations around the opioid epidemic, and catalyzing police-assisted paths to recovery. Under the program, people suffering from addiction can turn in their drugs at the police station without fear of arrest, so long as they agree to start treatment. “As far as I’m concerned, anything that disrupts the current state of play is a good thing, and I’m all in,” Baker said during remarks at the summit. “We’re going to have to be smart about how we move and change, and stay on it,” he said. PAARI cofounder John Rosenthal noted that the location of the conference, in Boston’s Longwood Medical Area near leading hospitals, was fitting for the initiative’s focus on treatment. Danny Langloss, the city manager and former police chief in Dixon, Ill., rebutted criticism over the push to pursue treatment rather than prosecution for substance abusers. “This is not weak on crime, this is not soft on crime; this is smart on crime,” Langloss said. Law enforcement officials at the gathering also said they’ve experienced some pushback. Police officers and community service officers from Boston, Chelsea, and Lawrence spoke about their programs to prevent harm to at-risk individuals and families. Through the Chelsea Hub program, law enforcement, social workers, and community organizers meet regularly to identify and offer holistic services to those at risk of falling through the cracks. In Lawrence, Officer Dan Fleming said he came to realize the connection between addiction, mental health, and homelessness. Lawrence experiences more than 300 overdoses a year, he said. Middlesex County Sheriff Peter Koutoujian said police departments need to be comfortable working outside the box. can be reached at morgan.hughes@globe.com.